Hello DVD, week 27 brings us Student Led Conferences (SLCs)! From March 11-14, we will run SLCs on our campus between 1:45-4:00 pm. This also means that students have minimum days (9:00 am -1:30 pm) from Monday-Thursday. Please contact a grade-level teacher with any specific questions about SLCs, or contact the front office and they can direct you to the appropriate individual. 10th Graders will be taking the PSAT on Thursday, March 14. Please make sure to eat breakfast and get a good night’s sleep! You may want to bring a snack and you are allowed to use an approved scientific calendar for a portion of the test, so feel free to bring your own. 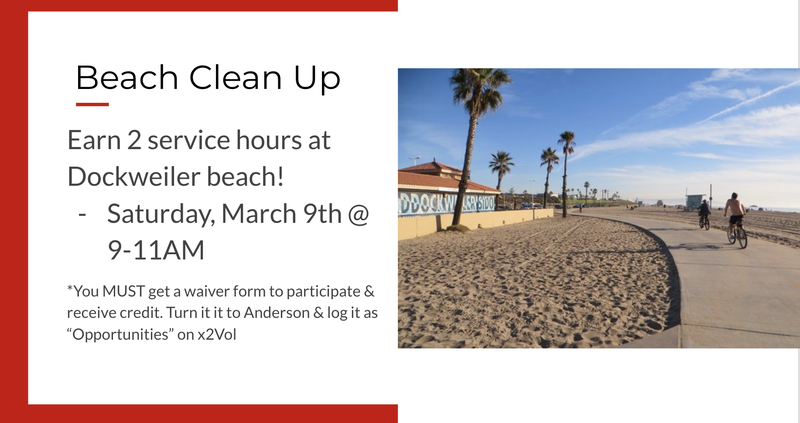 DVD, it is not too late to sign up for the beach clean up this Saturday. It is an excellent opportunity to earn service hours with your fellow designers! All students must complete a waiver to participate. See Mr. Anderson in Room 4302 with any questions. You should also sign up under “opportunities” on X2VOL as indicated below. March Newsletters from our Grade Level Teams! Hello DVD! Below you will find the amazing newsletters from our grade-level teams. They contain information regarding upcoming SLCs, as well as current course happenings. Check them out when you have a chance! 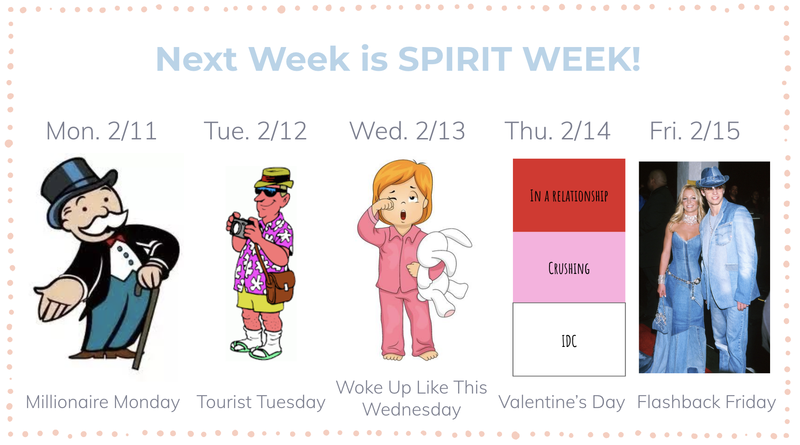 Designers, February flew! We are now entering March and week 26. Congratulations to the Black Student Union for putting on an amazing Black History Month Community Dialogue today – it was full of amazing student performances and original work. We are so proud of you! Check out our Instagram page (@dvdig) to see a few pictures and videos from today. We are excited to share that the RACC College Fair will be happening on campus during advisory from students in grades 9-11 (see special bell schedule below) on Thursday, March 7. Representatives from many regional colleges and universities will be in attendance. SLCs – Student Led Conferences – will run from Monday, March 11 – Thursday, March 14. Please check in with your student about this ahead of time and be on the lookout for communication from the grade level team (many of you have likely received initial information!). 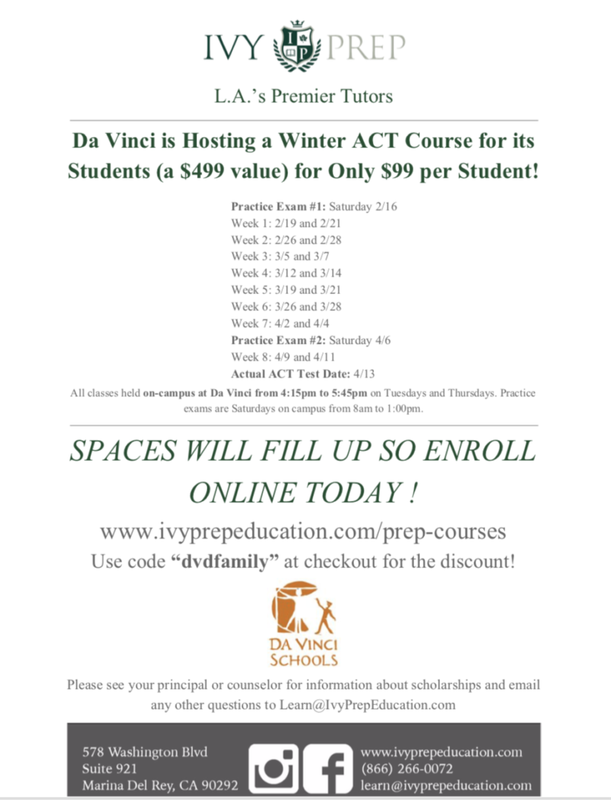 We want to share some good news happening over at DVX, Da Vinci’s college and career program. We are hosting Family Information Nights for seniors and their families on February 21st and February 28th at 6:00 PM at the high school campus, located at 201 N. Douglas Street. Please join the DVX staff and some current students for an informational presentation, followed by a Q&A session. We will be meeting in the Multi-Purpose Room. We hope you can join us! DVX Interest Form – if you are considering DVX as one of your college options, please feel free to fill out this form. A DVX staff member will contact you to answer questions and discuss how the program fits your educational and career goals. DVX Online Application – once you submit the application, a DVX staff member will contact you to set up an in-person meeting. As we finish this year off strong, we are very excited for the upcoming school year and can’t wait to meet our 2019-2020 DVX class! There will be more events to come, so stay tuned! Designers, below is your Week 24 update! No School on Monday, February 18 for the President’s Day Holiday. Counselor Chat – Wednesday 2/20 from 8:00-9:00 am – join us on the first floor!